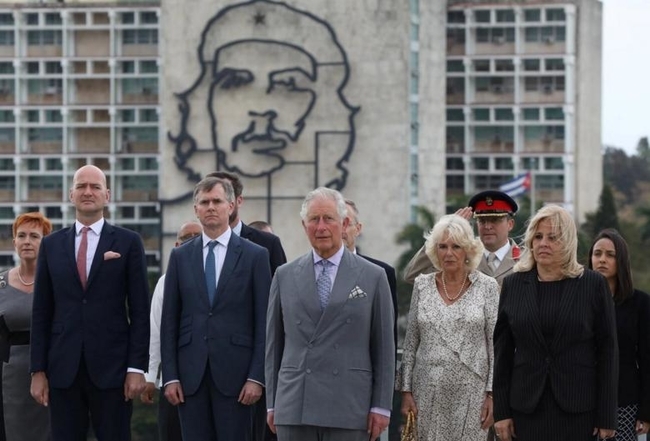 On 24 March, Prince Charles and the Duchess of Cornwall became the first members of the British royal family to visit the island since the Cuban Revolution. The four-day trip was part of a wider Caribbean tour to which the British government had asked the royal couple to add Cuba in the hope of boosting commercial and cultural ties. During the visit the royal party laid a wreath for Cuba’s national hero Jose Martí, attended a rally of British cars, had a tour of old Havana, and visited community and green projects, and the special economic zone in the port of Mariel. They also had dinner with Cuba’s President Miguel Díaz-Canel, whom the Prince had met at his 70th birthday celebrations in London in November 2018. British government officials accompanied the party, and while they were in Havana, the Cuban Foreign Minister Bruno Rodríguez had a phone conversation with British Foreign Secretary Jeremy Hunt. The visit sparked the ire of pro-blockade right-wing politicians in Florida. When the visit was first announced in February, Florida senator Rick Scott urged Prince Charles to reconsider the trip and visit Florida instead, to speak to the Cuban-American community there. Britain’s desire to strengthen relations is in contrast to the White House’s policy of isolation. The US government has just tightened the blockade and is looking to implement policies which target foreign investors in property nationalised after the Revolution. The visit was welcomed in Havana: “It’s always good for Cuba to strengthen its relations with important international actors, but all the more so when the United States has a president responding to the interests of extreme right-wing people who want to hurt Cuba,” said Arian Rubio, a Havana resident. The visit is a clear departure by the UK from the policy of its closest ally, and represents a wish to increase trade with the island. British trade with Cuba was less than $100 million last year. Rob Miller, CSC Director, welcomed the visit and said it “represented an important shift away from US influence over British relations with Cuba.